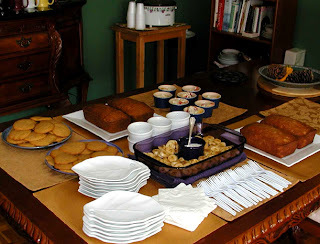 Last Wednesday, we held an open house, complete with pumpkin bread, peach bread, pumpkin cookies, brown sugar baked bananas, cider soaked pears and apples with cinnamon custard (yum! ), homemade apple cider, hot tea and coffee. Our special guests were the Black Mountain Chamber volunteers, an outstanding group of local residents who volunteer their time at the Visitor’s Center, helping travelers to learn more about Black Mountain and the surrounding towns, including Montreat and Ridgecrest. The Visitor’s Center contains a wealth of information, including maps, brochures for businesses, restaurants and lodging, hiking info and a walk-up computer for searching. The volunteers serve as guides to all this information and also to the history of the area. Our open house was a way of saying “thanks” to the group who helps our area be a great place to visit. What a fun group they are, too!